Reviews of foodstuffs! Mostly restaurants, but also some bakeries, chocolate makers, cafes, etc. I was in the Seattle area (Kirkland to be exact) for a working offsite for several days in October. 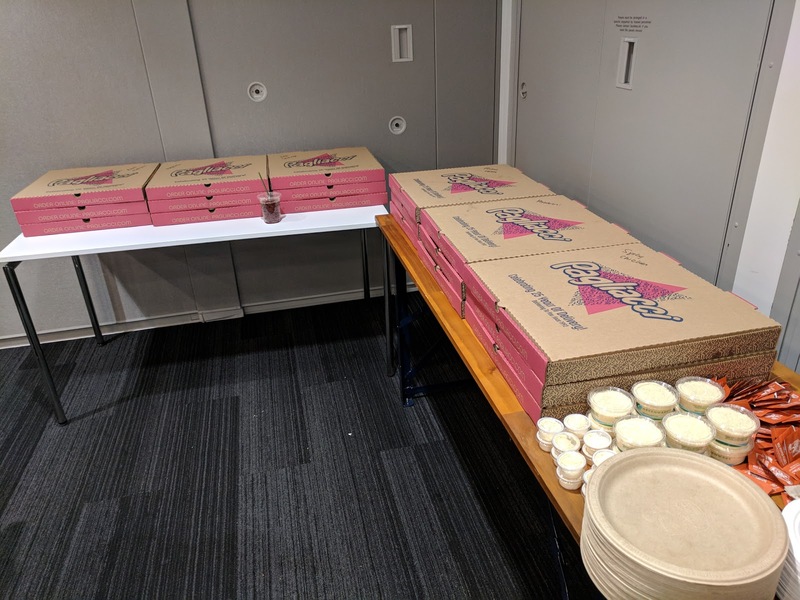 The first night, we had a late night "hackathon", and obviously needed food. Going out wasn't an option, as we were supposed to be hacking after all, so, pizza delivery it was. I really have no idea the last time I had pizza delivery, so this whole experience was a bit novel for me. We ordered from Pagliacci Pizza, the local place that was recommended. It is a Seattle based chain, around since 1979, and winner of some "best pizza" awards. 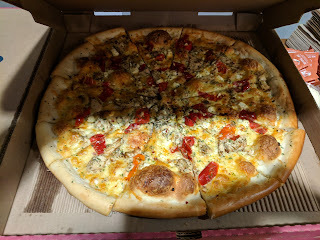 Overall, it was better than your average pizza delivery joint like Domino's or a local "Village Pizza" on Main Street, Anytown, US, and did feature some higher end ingredients. The menu even calls out some of the purveyors they use by name, e.g. Mama Lil’s peppers, Foraged & Found Edibles mushrooms, Laura Chenel's Goat Cheese, Hempler's Canadian Bacon, Cascioppo Bros. Italian Sausage, La Quercia Prosciutto, and more. The pizzas were clearly made with care, delivered hot and in tact, and their selection of suggested "Pagliacci's Favorites" pizzas were well curated. The only real element I wasn't a fan of was the crust. It was just boring, and not as high quality as the other components. It wasn't burnt, it wasn't stale, but it just was ... crust. I prefer a thinner, crispy style, or a charred wood even style, or, something. Still, for delivery pizza, it was fine. 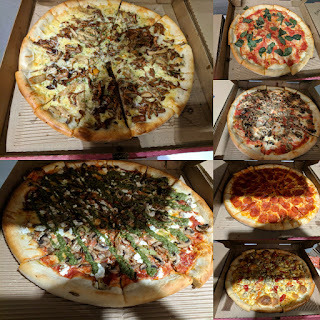 For my group of 70, I ordered 18 large pizzas, 6 different varieties, 3 of each kind, half vegetarian. Each box was labelled, and we were provided plates, napkins, forks, Parmesan cheese, and hot peppers to sprinkle on. "A traditional Neapolitan pizza with fresh mozzarella, basil, a dash of sea salt and olive oil with crushed Italian tomatoes as a base." I wanted to have something simple for those who don't like toppings, but I couldn't bring myself to just order "The Original", e.g. tomato sauce and shredded mozzarella. 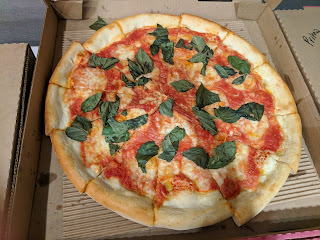 Instead, I upgraded to the Margherita for $4 more, to get crushed Italian tomatoes instead of tomato sauce as the base, fresh mozzarella instead of shredded, and basil. It looked fine, but I was interested in the more exciting options. "A veritable blanket of pepperoni over mozzarella and our seasoned tomato sauce." 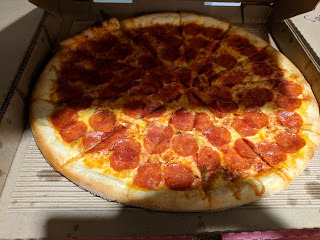 Also to please the crowds, I opted for pepperoni, because, well, pepperoni. Pagliacci's has an "Extra Pepperoni" on the "Favorites" menu, so I went for that, because, um, who doesn't want more pepperoni? If I had wanted another slice, I certainly would have gone for this one. "Marinated chicken, Mama Lil’s peppers, parsley, mozzarella and feta over olive oil seasoned with red pepper flakes." Pagliacci's had a number of chicken based pizzas though, I picked this randomly because spicy sounded fun? 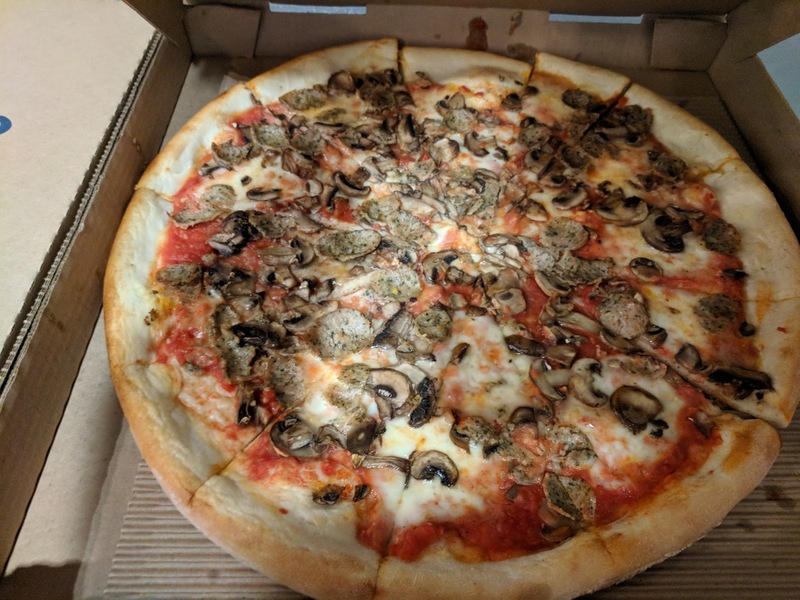 "Cascioppo's Italian sausage, Ostrom's mushrooms, fresh mozzarella, sea salt and olive oil with crushed Italian tomatoes as a base." 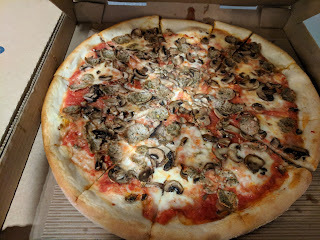 The meat pizza I ordered based on my preferences was the funghi salsiccia, since I like mushrooms and sausage, and the "crusted Italian tomatoes" as the base sounded more interesting than standard red tomato sauce. 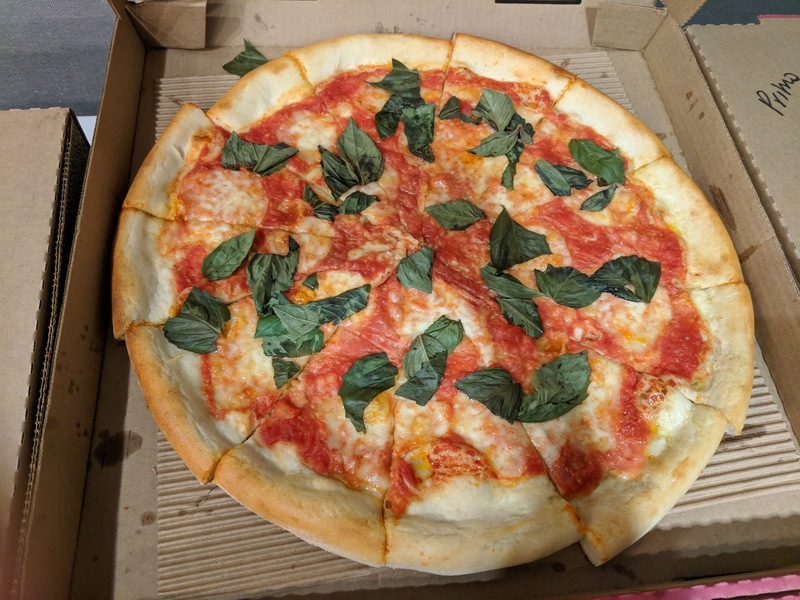 The crushed tomato sauce was basically just slightly nicer pizza sauce, more like what you get at any upscale pizza place. I certainly wouldn't have realized it was "crushed tomatoes" rather than sauce, but I didn't try one with the standard sauce to compare. It was fine, a light layer that didn't overwhelm. The sausage was thin slices of spiced italian sausage, enjoyable enough. The mushrooms were just sliced button mushrooms, but they were at least not the slimy kind from a can. The mozzarella cheese was again sorta like a higher end place in that it didn't overwhelm and would probably be considered sparse compared to standard pizza joints. Overall, another well made pizza, no topping overwhelming the others, everything well distributed. "We combine a medley of freshly harvested wild mushrooms from Foraged & Found Edibles and roast them with herbs. They are combined with onions, parmesan, mozzarella, provolone and fresh parsley over garlic and olive oil." The vegetarian option I picked because I wanted it was the wild mushroom primo, a seasonal special. It came topped with a mix of assorted wild mushrooms (far more interesting than the mushrooms in the Funghi Salsiccia). They were all cooked nicely, kinda meaty, hearty, and really an impressive selection. And like the other pizzas, evenly and generously distributed on top. This pizza also had soft sweet onions, which I loved. They combined perfectly with the mushrooms and the cheese. And oh the cheese. This pizza didn't just have standard mozzarella, it had a magical mix of provolone, mozzarella, and parmesan. I don't think I've ever had provolone on a pizza before, but wow, this mix worked great. It was chewy and absolutely coated the crust, and I loved it. Much more generously applied than the mozzarella on the other pizzas, I think intentionally, because it really helped form the base here. This pizza also had no sauce, but instead garlic, olive oil, and parsley rubbed into the crust. 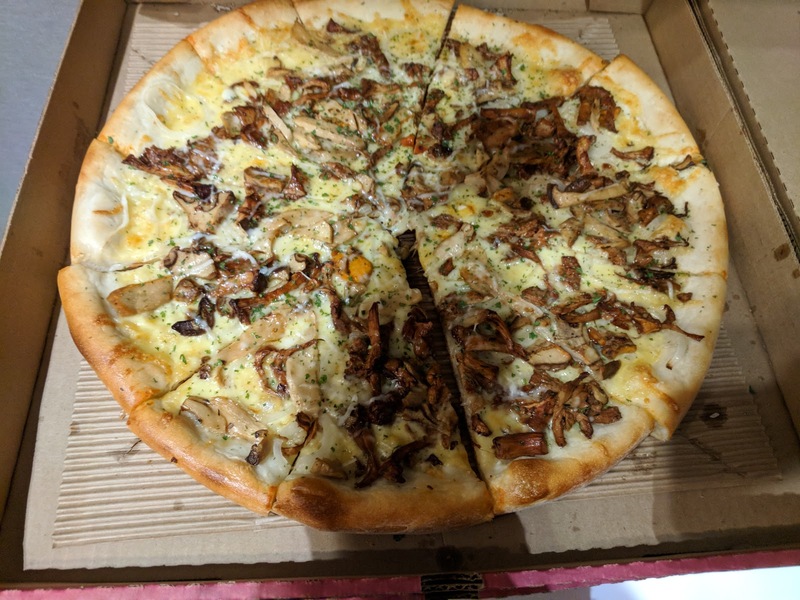 This too was excellent, and enhanced the strong flavors of the mushrooms, the sweet onions, and the flavorful cheeses. Sauce would have ruined this. If you can't tell, I adored this pizza. Well, the toppings anyway. Each element was fantastic, and they combined together just perfectly. 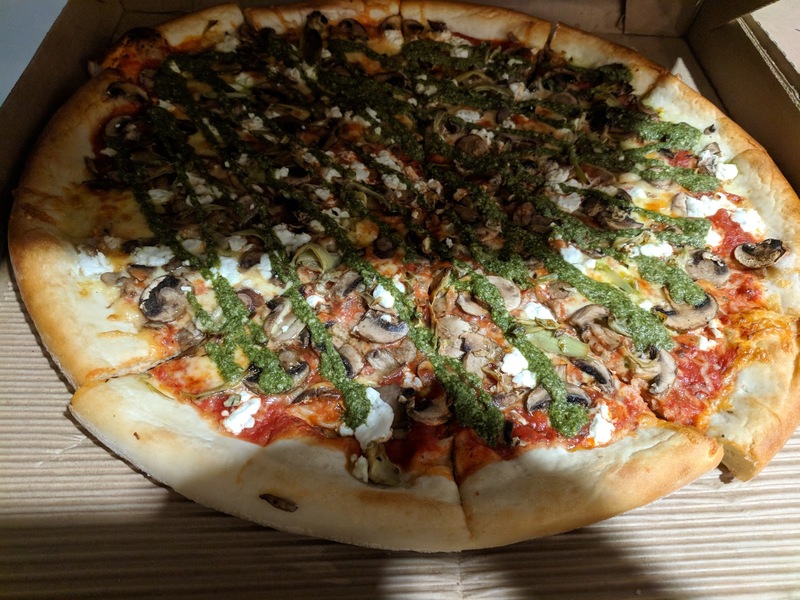 "Thyme-roasted artichoke hearts, Ostrom's mushrooms, pesto, Laura Chenel's goat cheese, garlic and mozzarella over our seasoned tomato sauce." The final vegetarian option was the hardest to select, as they just had so many combinations on the "Favorites" menu, so I asked one of the vegetarians to just select his favorite, and went with that. 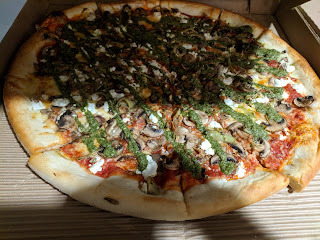 It had goat cheese which I hate, and artichoke hearts with I wasn't remotely interested in, but, I had plenty of other choices in pizza, so I went with his suggestion. It was the most attractive, again, clearly well made, with a pesto drizzle nicely applied. More expensive than the meat pizzas, but it makes sense, as it had so many different toppings, and I imagine goat cheese is just as premium as fancy sausage. Sicilian Chicken Salad. $21.49. Ceasar Salad. $16.99. We also ordered 2 salads, both "party sized", which said they would serve 8 people. Um, really? "Mixed greens and arugula combined with chicken, thyme-roasted artichokes, currants, sun-ripened tomatoes, and kasseri cheese tossed in a spicy vinaigrette." First up was the Sicilian Chicken, which had basically nothing in it I was interested in, so I skipped it. I still don't understand how this box of salad was $21.49? What? "Romaine lettuce tossed with Parmesan, croutons handmade by Macrina Bakery and our Caesar dressing." 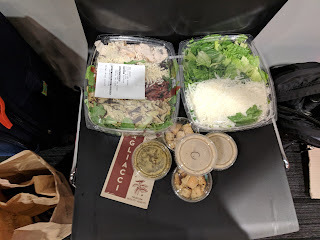 Next was the caesar, basic caesar with tons of shredded mozzarella, and the style of caesar dressing I don't care for - oily, zesty, rather than creamy. The lettuce was fresh enough, but overall, basically what you'd expect from a pizza place. © 2012 Julie's Dining Club All Rights Reserved. Designed By MyThemeShop. Blogger Theme by BlogTipsNTricks and Right Blog Tips.